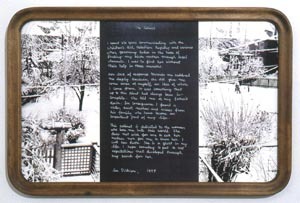 Installation view: Lee Dickson, Grimsby Public Art Gallery, Ontario, 1994. Photo: the Artist. The Cabinet is a modestly sized installation. The title is a color photocopy compilation mounted on museum board in a wood/glass frame. Ninety color photocopies of documents; text and images fill the thirty drawers of an early twentieth century typeset cabinet. An old oak stenographer’s chair of the same vintage completes the suite. Framed title piece: 47 x 69 centimeters. The cabinet: 108 x 88 x 53 centimeters. The stenographer’s chair: 87 x 61 x 61 centimeters. The Cabinet stems from a personal issue I have struggled most of my life to resolve. Within the cabinet are the documents, photos and stories covering the search for my biological family. Some drawers also contain short narratives focused on my desires and fears as I approached critical moments in the lengthly process. The search itself clearly reveals my need to find a true identity which I sometimes hoped would, but at times feared would not, lead to the the jubilation of finally being re-connected and accepted by my biological family: Even with this forewarning in mind, I was not prepared for the profound sadness brought on by a rejection. 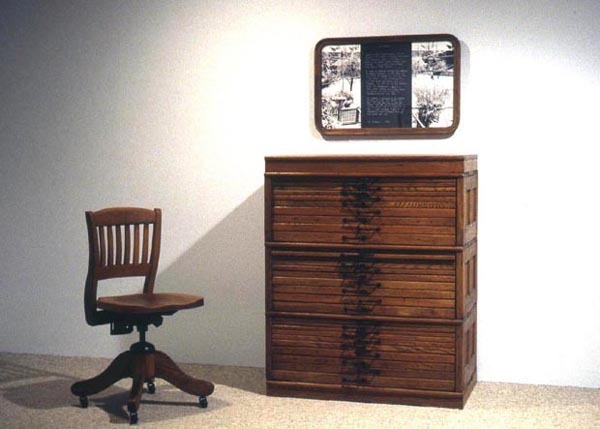 The old stenographer’s chair is provided for those who wish to review the contents of The Cabinet at their leisure. Lee Dickson, August 1994 – modified 2013. Title piece. This photo and the subsequent are studio shots by the Artist. I spent six years communicating with the Children’s Aid, Adoption Registry and various other governing bodies in the hope of finding my birth mother through legal channels. I was to find her without their help in three months. Her lack of response towards me saddened me deeply. However, she did give me a sense of who I was and where I came from which helped to alleviate a life-long feeling of incompleteness. She told me of my father’s death and through his family I discovered I had a sister, aunt, nephew and nieces who have become an important part of my life. This cabinet is dedicated to the woman who gave birth to me. She does not wish for me to call her mother or for me to know her. I call her Ruth. She is a ghost in my life. I hope someday to put to rest those expectations of her that took seed from my first knowledge of her existance and grew through the emotional journey of the search. "Artist to be on hand for opening of new show at Gallery." Independent [Grimsby] Sep 28 1994:8. Bauslaugh, Cheryl. "You gotta have heart." Simcoe Recorder Oct 10 1995: 6. "‘Other Frontiers’ at gallery." Focus [Grimsby] Sep 24 1994: 5. The Canada Council, the Ontario Arts Council . Webpage design built using Microsoft Notepad by Lee Dickson. Edited and proof read by Jill Lennox.